Why do you say it’s a Real Estate Gold Rush? Hi Everyone, its Stephen for TaxSaleSupport.com. Did you know you can buy real estate tax deeds for $50-$1000? This is not on Junk Land! But property you can wholesale for a quick profit? Investors can even act like the bank and seller finance the property to earn residually income. In addition with Bank Owned and Over the Counter tax liens, investing has never been easier. Both Shade and I have been scouring the United States identify prime real estate markets with an overflow of county inventory. We’ve been locating and documenting these counties and collecting their property lists. In addition we have also targeted counties that allow less than taxes owed. This means investors can buy property for as little as $50-$500. In the photos below we have included some tax sale properties purchased by Members over the last 30-days. 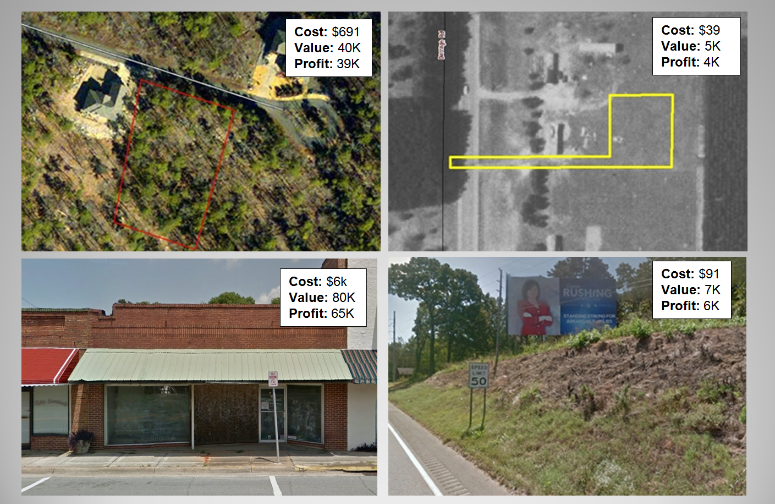 These tax deeds include a commercial building, building lots and a billboard space. The properties where purchased by only paying the delinquent taxes of around $36 to $6,000. And what’s awesome are the properties have a market value of $5,000 to $80,000! And did I mention these where purchased Over the Counter! How can I invest in real estate for under $1000? That’s a great question. I believe there are two ways to begin tax sale investing. The first way is to spend countless hours researching county laws, websites, auction lists, property evaluations and lots of trial and error. The first approach is the way Shade and I got started doing 20-years ago. The second way is to work with a mentor that has already had success in the field. And most important, helped other investors become successful. We believe this is what Shade and I offer at TaxSaleSupport.com! We don’t have a fancy sells pitch, were not salesman. We are coaches, teachers and investors. To speak plainly, we believe if the value in our training is not obvious we recommend trying out our competition. We are confident investors won’t find a better offering for tax sale training and support. In fact if you do find a better offer, let us know and we will give you a 30-Day guest pass to our Membership. The problem is we have not been taken up on the offer yet. It’s impossible to find a better value! To become a Member you can CLICK HERE - or to see what’s included in Membership. Also, for this week only anyone that registers for TaxSaleSupport.com Membership will receive “Two 20-Mintue Coaching Calls with either Stephen or Shade”. You must Register by January 31st to get the Free 2 Coaching Calls included in Membership. Membership is only $39 a month and comes with a 30-Day Money Back Guarantee. CLICK HERE to review the Membership offer. We hope we can help you get started with Tax Sale Investing and I will see you at the auction.